The 12th Annual CHDI HD Therapeutics Conference was held in St. Julian’s, Malta, April 24–27, 2017. 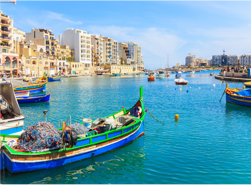 The 12th Annual CHDI HD Therapeutics Conference in the town of St. Julian’s, Malta, welcomed scientists from academia and industry to present data and discuss current research aimed at treating HD. The conference opened with a powerful and inspirational keynote speech from the Miner/Mulligan/Colerdark/Johnson family, who discussed the impact that HD has had on their lives over the past two years since the mother and two of three daughters were diagnosed with HD. The first scientific session, chaired by Dr. Jim Rosinski (CHDI) and Dr. Lesley Jones (Cardiff University), focused on the utility of unbiased systems approaches to studying HD. Dr. Jones and Dr. Davina Hensman Moss (UCL) presented work implicating DNA damage/repair response genes as key genetic modifiers of HD onset and progression. Dr. Chris Kay (UBC) discussed haplotypes associated with the CAG expansion mutation and how these can be used for allele-specific silencing of the mHTT gene in different HD populations. The next session, chaired by Dr. Matt Lee (CHDI) and Dr. Marcy MacDonald (MGH), shifted focus to HTT structure and function. Dr. Kevin Weeks (UNC) presented work on novel technology to determine the structure of HTT mRNA and to design small molecule therapeutics against mHTT-specific RNA structures to achieve allele-specific silencing. Dr. Albert Ruzo (The Rockefeller University) presented work showing novel developmental phenotypes present in HD compared to isogenic control human embryonic stem cells (hESCs). The next scientific session, chaired by Dr. Andrew Howard (CHDI) and Dr. Edward Wild (UCL), shifted focus toward HTT-lowering therapeutic approaches for HD. Dr. Wild presented compelling data implicating neurofilament light chain levels in the CSF and plasma as reliable biomarkers of HD progression. Dr. Nicole Déglon (Lausanne University Hospital) spoke of her work using a novel self-inactivating CRISPR/Cas9 system to suppress HTT both in vitro and in vivo. The next session, chaired by Dr. Roger Cachope (CHDI) and Dr. Andrew Leuchter (UCLA), focused on the role of neuronal dysfunction in HD. Dr. Joseph Cheer (University of Maryland School of Medicine) spoke of the impairment of the endocannabinoid system in HD patients, and the potential benefit of endocannabinoid-based therapies for treating the psychiatric symptoms of HD. Dr. Abdellatif Benraiss (University of Rochester) presented exciting work using virally expressed brain-derived neurotrophic factor (BDNF) and noggin to promote mobilization of endogenous neural stem cells to replace striatal medium spiny neurons (MSNs) as a potential disease-modifying therapy for HD. The final scientific session was chaired by Dr. Rebecca Fuller (CHDI) and Dr. Francisco Cardoso (University of Minas Gerais), and examined emerging opportunities for HD therapies. Dr. Anne Rosse (Cardiff University) presented the current status of cell-replacement therapy for HD via transplantation of hESC-derived MSNs. Dr. Andrew Yoo (Washington University School of Medicine) presented some of his group’s work using micro RNAs along with growth factors, for direct neuronal reprogramming of HD patient somatic cells to model HD. This year’s CHDI conference saw major advances in our understanding of genetic modifiers on the course of HD; novel therapeutic approaches to target HTT at the DNA, RNA, and protein level; new biomarkers to assess disease onset and progression; and strategies to promote survival of vital neural pathways as well as to replace neurons that have degenerated as part of the disease, among other notable research. Together, the unrelenting efforts of the HD scientific community continue to push us closer to treating this devastating disease. So what exactly is Enroll-HD? Enroll-HD is a worldwide observational study for Huntington’s disease families. In an observational study, investigators assess health outcomes in groups of participants according to a research plan or protocol. But Enroll-HD is much more than just a joining of study participants and researchers. Enroll-HD has the opportunity to change how we look at HD, and show how the disease appears and changes over time. Enroll-HD will also eventually include almost 20,000 participants from North America, Europe, Latin America, New Zealand, and some countries in Asia. That makes Enroll-HD a huge study, the focus of which was today’s Enroll-HD Site Investigator Meeting at the first day of HSG 2015 in Tampa, FL. What should some of the key takeaways be from today’s meeting? For starters, recruitment should still be a key part of the overall study “strategy.” The more participants in the study, the more data that can be collected on the disease itself. During the afternoon panel session with Joe Giuliano, Jody Corey-Bloom, Mark Guttman, Bernhard Landwehrmeyer, Martha Nance, and Francis Walker, the participant experience was a hot topic in an open forum discussion. Of interest was the discussion how some HD families were participating in the trials and their motivation for doing so. Some researchers reported that participants in Enroll-HD at their clinical sites like being in the study because it helped them feel as though they were contributing to a cure. Other researchers mentioned that for some people, the once-yearly study visit was a chance for a check up with their doctor to see how their disease was progressing. And for some participants, it was the only way they would get to see a Huntington’s disease specialist. Why should this be important to the HD community? Let’s be honest, Huntington’s disease is a family affair. Did you hear the chorus of the popular 1971 song of the same name by Sly and the Family Stone? All jokes aside, the fact that HD is a family disease and that Enroll-HD is a study on HD families makes it an incredibly important and useful study that can help advance scientific knowledge on a very complex disease. Information about those who are at-risk of HD, and for those who are HD caregivers is also collected within Enroll-HD. Data collected within Enroll-HD can be shared across other HD-related studies and can help other researchers access volumes of data quickly and effectively. There are currently 7,696 participants in Enroll-HD. How can you help us get to 20,000 participants? The conference was held this year in Palm Springs, California. At the 7th Annual CHDI HD Therapeutics Conference in Palm Springs, California, scientists from academia and industry convened to discuss the current state of drug development research aimed at slowing the progression of Huntington disease (HD). Robert Pacifici, CHDI’s chief scientific officer, opened the conference. The first session of the meeting reviewed the relevance of systems biology to HD research. The opening talks by Lee Hood and Keith Elliston, CHDI’s vice president of Systems Biology, outlined the systems biology field and suggested whole genome sequencing of HD families to gain more genetic information about the processes that affect HD phenotypes. Elliston specifically described ways that CHDI is already using this technology. Jim Gusella discussed the discovery of genes that modify the age of onset in HD. The session ended with Hanchuan Peng, who described the “3D neuronal atlas” model that his group is developing to quantitatively measure synapses. The next session focused on post-translational regulation of the huntingtin protein. Melissa Moore opened the session by reviewing recent work that examines the toxicity of CAG expansions in RNA; the possibility of toxic RNA in HD; and posed the idea of targeting the RNA to knock down mutant huntingtin (mHtt) levels. Naoko Tanese reviewed recent reports of huntingtin functioning at sites of local translation in distal parts of the cell, and indicated that huntingtin traffics RNA to these sites. Lisa Ellerby and Dimitri Krainc examined the classic post-translational modifications of huntingtin and how these modifications may be drug targets. Marcy MacDonald ended the session by describing how her group has screened the full-length protein for novel post-translational modifications and has assigned signatures to mHtt vs. wildtype huntingtin. Session three highlighted current efforts to silence the expression of mHtt. Beverly Davidson showed published results that highlight the safety and efficacy of RNA interference in the primate brain. Frank Bennett (see interview on page 8) from Isis Pharmaceuticals described his work on using antisense oligonucleotides (ASO) to silence the expression of mHtt, and discussed possible efficacy of ASOs in the brain, administered by infusion into the cerebrospinal fluid. Steve Zhang highlighted Sangamo BioScience’s successful efforts in using zinc finger protein transcription factors in other diseases and talked about the recent efforts of the company in using this technology in allele-specific silencing. William Kaemmerer described the biomarkers necessary to test the efficacy of these therapies in humans. Neil Aronin described the efforts of his group to refine technical procedures that will enable therapies utilizing adeno-associated viral delivery of small RNAs to become a reality. The keynote address was given by Ann Graybiel, who described her efforts to understand the cortico-striatal pathways and their potential for manipulation. Following her talk, a session on small molecule drug discovery featured efforts by different drug companies, such as Pfizer’s previous work on phosphodiesterase inhibitors. CHDI’s Varhi Beaumont described their assays in HD mice testing Pfizer’s drugs and discussed the collaboration between their two organizations. Ladislav Mrzljak described CHDI’s investigations on kyneurine 3-monooxygenase inhibitors. To finish the session, Graeme Bilbe from Novartis highlighted recent efforts in characterization of an mGLu5 receptor agonist that has previously been effective in multiple models of neurodegeneration. The final session gave an excellent overview of clinical perspectives of HD. Cristina Sampaio from CHDI described the group work currently in place to achieve the company’s goal of running “smart trials”. Sarah Tabrizi outlined the three-year results from the TRACK-HD study, including endpoints that can be used in clinical trials, and introduced the follow-up Track-On-HD study. Mark Guttman discussed the clinical onset of HD symptoms and asked whether current diagnostic criteria should be changed. In the final talk, Michael Hayden discussed the actual prevalence of HD. A detailed study conducted in British Columbia revealed a gross underestimation of the prevalence of HD in that population.